Do you ever stand in your kitchen, a fingerfull of raw batter in your mouth, and just smile because you already know that you've hit the mark? Food police everywhere warn against the consumption of raw and undercooked things, especially eggs, but I am a full-fledged batter tester and nothing anyone says to me will ever change it. That moment of shear delight, when raw cake stands perched and ready to go into the oven, that is when I take early pleasure in knowing if my baked good has succeeded. This morning when I waited impatiently for the minutes of baking time to tick by, and comforted myself with those early raw tastes, I already knew this cake was going to be a favorite. 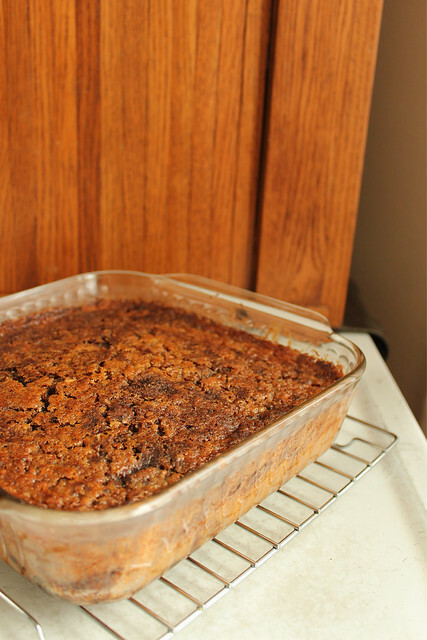 Last Sunday, I finally made the Lithuanian Coffee Cake taken from the book Welcome to Claire's. I had wanted to make the cake for months, a true testament to my ability to refrain from too much sugar this year. However rigorous I think I have become in the sugar-free department, I am fairly certain that from birth I was raised to enjoy a little sweet nibble with the morning coffee, whether it be named cake or otherwise. There is something about the way a bit of sugar complements the bitterness of coffee that makes the day complete. If I'm going to bake, let me always be able to bake something to be enjoyed in the morning. My son reminds me, "Coffee cake is a cake that you eat when you are drinking coffee, not a cake that has coffee in it." While that is true, I didn't want to confuse him by telling him that there is sometimes coffee in coffee cake. In fact, I add coffee to nearly everything chocolate that ever comes from my kitchen. I feel sneaky and underhanded, upping the flavor of the chocolate by included heavy pinches of espresso powder when no one is the wiser. 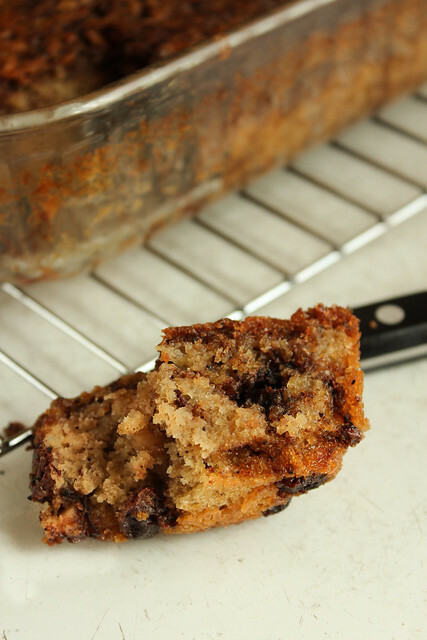 But some cakes, like this Lithuanian Coffee Cake, actually do have coffee in them. Not enough to replace your caffeine consumption for the day, but enough to enhance your coffee drinking experience. Claire's version was a butter cake made in the standard way and baked in a bundt pan. I liked it a lot, but it seemed a bit dry after it aged a few days, and the filling ingredients included raisins which when baked on top (the bottom when inverted) were a bit burnt tasting to me. 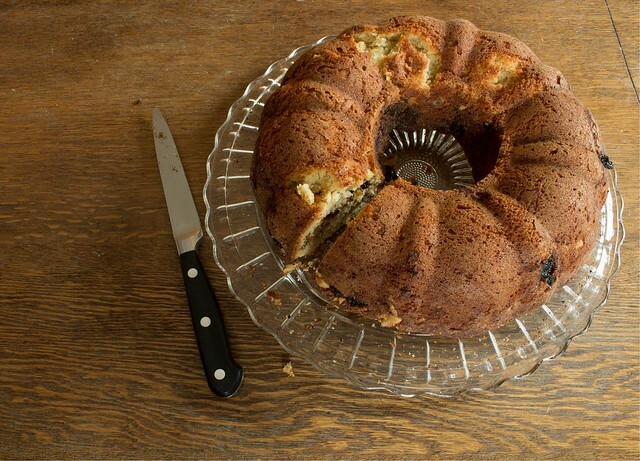 That is just nit-picking, however, since I really loved the flavor of the cake, and made my half of the bundt (I gave half to a friend) last until yesterday. This is after the sourdough, flour, and milk fermented overnight. I've been increasing my amount of well fed, "discard"starter lately, and out of curiosity (and lack of cake) I decided before bedtime last night to mix up a true sourdough cake: one that ferments overnight to reduce all of the indigestible parts of the wheat flour. After all, if I'm going to go on a cake-making and cake-eating binge, I may as well make it the healthiest possible way, right? The night before (or at least 7 hours before you want to bake), combine the starter, flour, and milk and mix well. Let stand at room temperature well covered. When ready to continue, preheat oven to 350, and butter an 8x8 glass baking dish very well. Mix all of the filling ingredients together in a small bowl, and set aside. To your fermented sourdough base, add the sugar and stir until well combined. In a 1-cup liquid measure, measure out olive oil. Add to it the egg, salt, espresso powder, and vanilla, and whisk well to combine. Just before ready to pour the cake into the pan, add the baking soda to the rest of the ingredients in the measuring cup and whisk well. 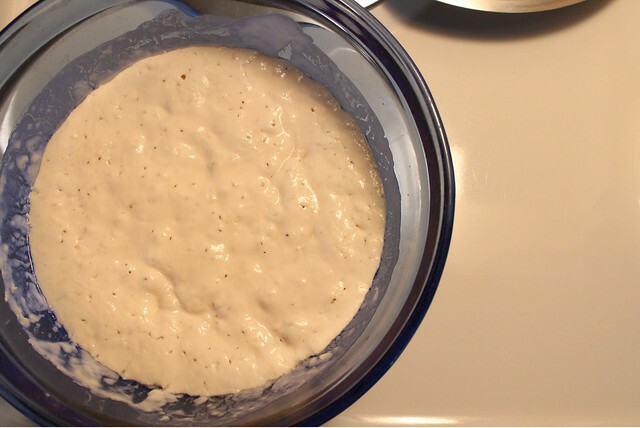 Immediately pour into the sourdough base, and stir well to combine. Pour about half of the batter into the prepared pan. Sprinkle about 2/3rds of the filling over the top, making sure to include most if not all of the raisins. Top with the remaining batter. Sprinkle the last of the filling over the top. Using a long spatula, knife, or chopstick, swirl (as if to marble) through the cake. The intent isn't to create a true marbled effect, but rather to gently incorporate the filling through the dough, since the sourdough batter is a bit foamy after adding the baking soda. Bake in preheated oven for about 50 minutes, until the tester comes out cleanly from the center. Cool for as long as you can in the pan before cutting. You may wish to top with an icing or a thinned buttercream frosting, but it is perfectly good as is. I actually liked the cake more than I suspected I would. Even after tasting the batter - it surprised me. It's incredibly moist, and seems sweeter on its own than the non-sourdough version (which really did need frosting to help it along I think... not that there is anything wrong with that). The final sprinkle of sugar makes a crispy crust, perfect for alongside your first cup of coffee for the day. Those few cacao nibs that I added on a whim were a good idea, when still a bit warm they were a true chocolate nuance without any of the sugar of chocolate chips or chunks. Making sure the raisins were all tucked underneath the batter was a good idea too since they all plumped up adding sweetness without any burnt caramel undertones. I was actually curious what makes this cake deserve the name "Lithuanian". When searching for Internet answers, all that came up was Clare's Corner Copia in New Haven, Connecticut and this insanely popular dessert that has been served there for the past 35 years. I'm thinking that the marriage of raisin and coffee is a decidedly Eastern European combination, and maybe one that resonates so well with me because of my ancestral roots in that part of the world. In any case, making either the traditional version (from Claire's, read here), or this very worthy sourdough version will make the side of your coffee cup very happy.